"...maybe he can teach me a thing or two." 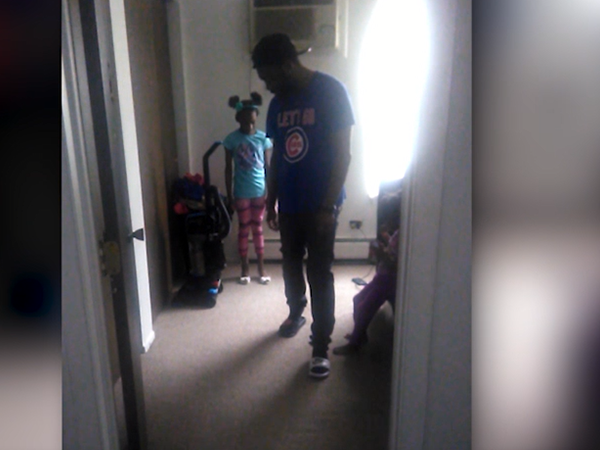 This is the hilarious moment a doting dad is caught channeling his inner diva to teach his daughter how to walk in heels. After returning home from a day of shopping, Kandice Gillespie is greeted by an unconventional scene as daughter Saniya, six, is being expertly coached by her dad to strut in stilettos. Caught in the act in Woodridge, Illinois, USA, diva-licious dad Erick Lewis is shown swaggering confidently, repeating 'heel, toe' with every step, as he shows his daughter exactly how it's done. Laughing along in awe of her partner's hidden talent, Kandice proclaims this is 'parenting 101' as Erick continues to give Saniya expert tips before announcing 'that's how you do it, baby'. Describing that moment, Kandice said, "I was so shocked when I came in through the door, I thought it was adorable and wanted to capture the moment on film. Usually Erick is such a 'guys, guy' but it seems he's really found his niche now." She also added that it was Erick's idea to teach their daughter how to walk in heels. "When I asked him why he said 'a dad's got to do, what a dad's got to do." "Saniya kept asking me how 'dad got so good at walking in heels?' and I'm not sure either. "Everyone found it hilarious and keep saying maybe he can teach me a thing or two."